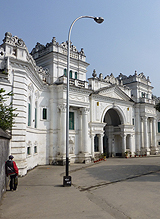 The Narayanhiti Palace was, until the 2006 Revolution when the Monarchy were toppled, the residence of Nepal's Royal family. The existing building was built in 1970 and replaced the original which was destroyed in an earthquake. Until 2001 the Royal family were highly revered by most Nepalese people, but on the 1st. of June of that year The King, his Queen along with 8 other members of the family were shot dead by the son and heir Prince Dipendra who then shot himself only to go into a coma and dying 3 days later. This all took place in an out-building which has now been demolished, there are plaques where each shooting took place. However, following this act there were many conspiracy theories throughout Nepal, many did not accept the official story. The Throne went to the surviving son Gyanendra Shah but his reign only lasted for 7 years. Up until his reign Nepal had a constitutional monarchy. In 2005 he suspended the constitution and declared direct authority saying it was to suppress the Maoist insurgency. After much rebellion over this decision he reverted to the Constitution in 2006. All this led to much torment amongst the people and Nepal abolished the Monarchy and became a Republic in 2008. The King, now a commoner, still believes a return to Constitutional Monarchy if the way forward. Basically, the Palace has been left as it was lived in, the furniture, decoration, photographs and Pictures are all as they were in 2008. The Palace is much visited by Nepalese people, especially School Children. When you arrive you may be surprised at the long queues but Security Guards will favour Tourists (who pay five times more than Nepalese people) and guide them to the front of the queue. After you've paid the entrance fee, about £3, you then pass a second security point before entering the Palace itself. The route around the Palace is marked out with arrows and this takes you through the main entrance hall, into the visiting dignitaries Suites, Rooms of Office and the private apartments of the Royal Family themselves. All the way round you will see photographs of prominent World persons such as the British Royals and American Presidents. After this you enter the garden, first walking through the demolished out-building area then into the ornamental main gardens. Wherever you go there are Security Guards, so to attempt any crafty photographs with a Mobile Phone is not recommended. The tour will take you about an hour. You are not allowed to stop and sit anywhere, you have to keep on the move. This is not negative, it's simply the situation and does not distract you from the grandeur of it all. I have to say that although I found the Architecture and contents splendid and most interesting, I did feel somewhat sad. For me the building has a sad background in the sense of 'rise and fall', it has certainly seen some quite major recent history. But without a doubt, the Palace is well worth visiting. Photography is not allowed in the Palace Museum, you must place belongings in a Safe at the Ticket Office and collect upon exit (hence no photos or videos to show you). Security is very tight.